Welcome to our Winter Warmer Newsletter. We have been busy welcoming all our southern visitors that have been migrating north to escape the winter chill. It is great to see so many regulars returning as well as meeting the newbies. Mick has been busy replacing the canvases on the safari tents and keeping the park looking top notch. Make sure you say hello to him if you see him whizzing by. Agnes Water Beach is fast becoming one of the top destination for sun and fun with it currently been rated #16 beach in Australia’s top 100. So if you haven’t been to see us for a while then put it in the diary. To help you along over winter we are running our Stay 7 & pay 4 deal across all of our accommodation types (excluding sites). So get in quick and book your getaway. 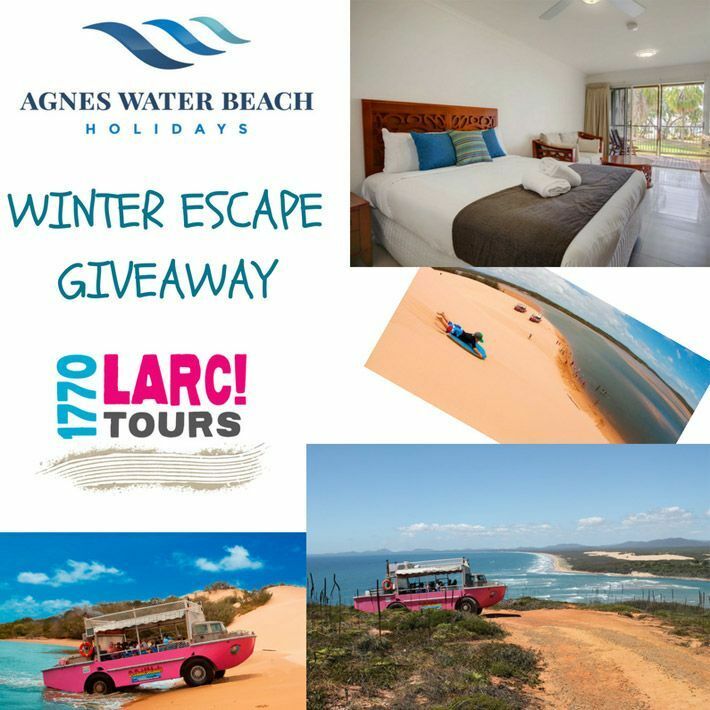 Win a 3 night escape for two staying in a beachfront studio at the popular Agnes Water Beach Holidays. Included is a full day tour from our friends at 1770 Larc Tours. Now that`s something to get excited about. 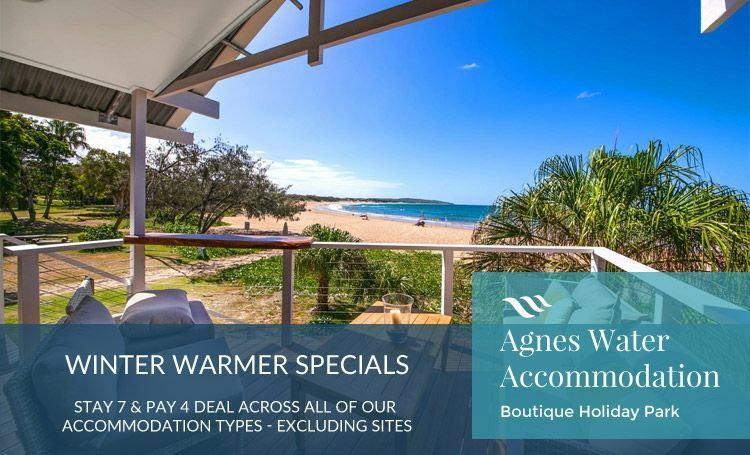 Agnes Water Beach is fast becoming one of Queensland`s top destinations for sun and fun. Rated Australia`s #16 beach in the top 100 list. We`d love you to like us and share us. For your chance to win complete the form below. GOOD LUCK! Our winter giveaway competition closes 29th June, so be sure to check us out on Facebook for details on how to win. Please like us on Facebook to ensure you don’t miss out on future giveaways or follow us on Instagram. 1770 LARC! Tours operate two pink amphibious crafts to explore the National Parks and pristine waterways bordering the Birthplace of Queensland – the Town of 1770 – in Queensland’s Southern Great Barrier Reef region. The ex-military Lighter Amphibious Resupply Cargo (LARC) vessels have the perfect capability to visit isolated beaches for guests to spot Australian wildlife, migratory seabirds and marine life, to cross sandbars and tidal creeks for access to towering 35 metre dunes for sandboarding fun, and to climb the steep headland to the historic island lightstation of Bustard Head which has Queensland’s only operating lighthouse open to the public. Until next time – stay warm. Agnes Water Beach Holidays Team.